Arkane on delivering a fitting finale for Dishonored's spookiest character. God-killing might sound like an ambitious notion for a standalone expansion, but with Death of the Outsider, Arkane Studios promised players the opportunity to do just that. The expansion is also the latest example of a trend where developers experiment with an established series to create something that’s not quite DLC or sequel, but something in between. Refining certain ideas, systems and mechanics present in Dishonored 2 enabled Billie Lurk’s revenge tale to be its own beast. “It’s true that we could have told that story through a two or three-part season of DLC,” says Dinga Bakaba, the game’s lead designer. “The push for a standalone was really a choice that benefited the overall quality of the game the most.” Though smaller, more focused and arguably more linear than Dishonored 2, the tale of the Death of the Outsider was the perfect opportunity to give players a satisfying sense of finality. Almost everyone at the studio agreed that a separate release was the best route to take if the epilogue was to be done justice. 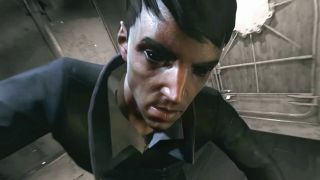 The series’ long-standing director, Harvey Smith, had actually toyed with the idea since the first day of working on Dishonored 2. Though post-release DLC for the original 2012 game was well received, certain restrictions always come when developing additional content in the traditional manner. The plan for Death of the Outsider was to avoid those. While Death of the Outsider is, in many ways, a game about endings, the standalone offering also marked many firsts for the franchise. The most notable example of these firsts is the absence of the Chaos system, a previous Dishonored calling card where player violence affects things like the number of guards in the game as you progress. As Billie Lurk, you’re no longer punished for taking a more lethal tack when getting in and out of Karnaca’s objective areas. It’s a difficult balance to strike, but Death of the Outsider largely manages to pull it off successfully. Billie offering the player a grey moral compass—a far cry from the duty-bound personalities of Emily and Corvo—signifies an Arkane willing to trust players more than in previous outings, particularly in terms of pacing and how to best tackle the game’s optional side activities. Also contributing to that attitude is the fact that activities can be approached differently thanks to Death of the Outsider’s big new power: Semblance. This lets players assume the likeness of any available NPC, essentially stealing their faces to open up new solutions to problems. Death of the Outsider, then, makes the case for expandalones being the perfect means by which to blend systems and mechanics that are both old and new. They can be an ideal way of placing less strain on developers while still creating a product for new players who want an entry point to the world, or seasoned players aching to spend more time with characters and a setting they’ve grown to love. “Returning players will likely enjoy the story more because the plot is about the Outsider, Billie and Daud,” says Bakaba. “The narrative works much better if you are familiar with the characters, you get the biggest payoff that way. But at the same time, in terms of gameplay, it’s a brand-new player character with new powers and gadgets. “We added video tutorials for new players, the action can be very unshackled as it ships with features like custom difficulties, and the new Contracts system allow you to plan a shorter play session around more bite-sized objectives. So new players can really enjoy it for the gameplay.” The intention, Bakaba explains, is that “all will have a great time” with the game.